Back at set #58, I mentioned how bad 1990 was in the card world. Sadly, 1991 was probably worse. The 1991 Topps set was the saving grace in a world of bright blinding yellow Fleer cards and the first ever Upper Deck set to get a rating of “meh” on a scale of puke to ZOMG AWESOME! Night Owl Cards did a comparison of 1990 and 1991 baseball cards as a whole and 1991 came out slightly better. And I agree, at least partially because of Bowman, Score, and this 1991 Topps set. Let’s be honest: Topps had some real stinkers to run up to this set. 1990 and 1988 were in my 5 worst. Spoiler alert: 1989 is coming only a month or so away. 1986 was among the 10 worst. 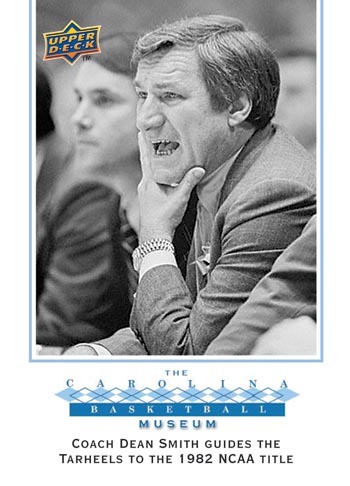 1987– I’ll go ahead and say it– 1987 will be in the top 10. 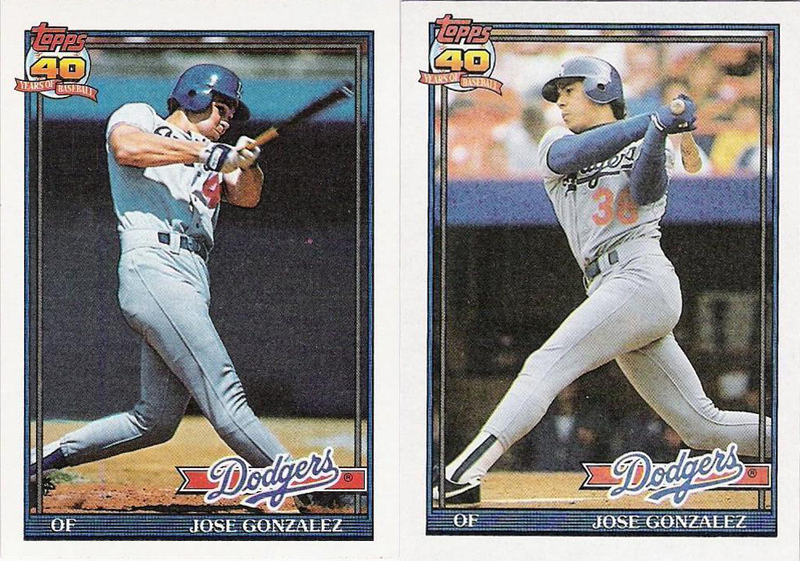 So in the previous five sets before 1991 Topps, they had 3 really bad sets, one really good, and one mediocre. So the world needed something different. 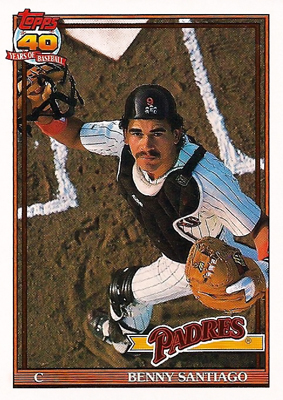 And so, 1991 Topps entered the picture. Topps was starting to look into ways to compete with Upper Deck and later in the year, the premium Stadium Club brand came along. Incredible photography, a borderless design, and enhanced stats on the back. And with that innovation, the “not so incredible but still better than our previous efforts” photos experienced a trickle-down effect to the main Topps set. Now with Topps getting another set’s rejects, it would seem their photography would be bad. But it wasn’t. 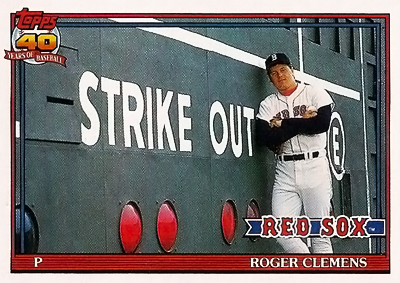 Even the Stadium Club rejects were better than anything seen in a long time in a Topps set– possibly ever. 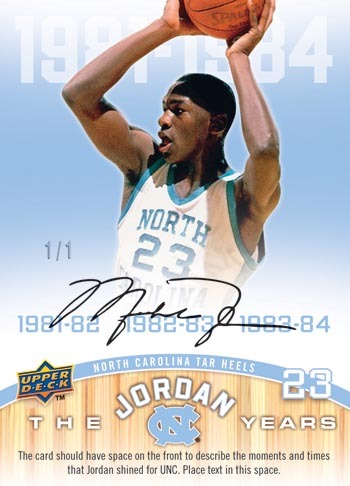 One of the things I graded sets on was iconic cards– those cards where you can close your eyes and picture them in your head. And 1991 Topps is loaded with them. The blue sky and clouds behind Wade Boggs. Benito Santiago’s photo being taken by a photographer hitching a ride on a foul ball back and out of play. Roger Clemens standing next to the Strike and Out (thus reading Strike Out) on the Fenway Park scoreboard. Canseco blasting a ball. The design was solid, with the Topps 40th anniversary logo in the top left, the team name at the bottom right, and the name and position across the bottom, all framed neatly inside the white borders and team-colored piping. I like it a lot, really. However, once again the rookie crop– or lack thereof– brings this set down. 1991 had some good ones. Topps hit on Chipper Jones, but failed to include Mike Mussina. No Jeff Bagwell or Ivan Rodriguez: the five major companies all missed them until their update sets. No one had Juan Guzman until 1992 (not even the Traded/Update sets, as far as I can tell) even though he was the 1991 AL ROY runner-up. The main rookies Topps included besides Chipper: Alex Fernandez, Carl Everett, Greg Colbrunn, Mike Lieberthal, Dan Wilson, and Phil Plantier. Remember when we all thought Phil Plantier was going to be the next big thing? I’ll admit I was duped into thinking he and Matt Mieske and Marc Newfield and Willie Greene and Melvin Nieves would be the next group of greats and I‘d be handing my kids their rookie cards as we saw their plaques in Cooperstown. So aside from Chipper Jones, 1991 was a weak year for rookies. Ahh yes. I see what you did there. 1991 Topps also was when the brainchild of the parallel set was born. Actually it’s more like the brainbastard was spawned. In 1991, Topps created their Micro set. I love the micro sets; I only have the 1993 set, but still, love it. Sold as a factory set only, the cards were about the size of a postage stamp. I don’t know why anyone would want it, but I love it. Anyways, in that set came 12 gold cards where the background was done with gold leaf. Cool idea. Unfortunately, that idea became a nightmare in 1992 when they made Topps Gold a parallel and the “Hey let’s just remake every card with a slight difference” craze was born. Everyone has seen the various vintage giveaways that Topps has had over the past few years. 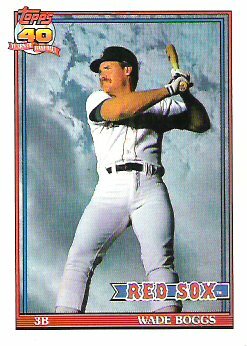 In 2006 they put a vintage card in every rack pack (my two rack packs from that year BOTH carried a 1985 Topps Barry Bonnell; I hate you, Topps). In 2010 it was the Million Card Giveaway. In 2011 it’s the whole diamond anniversary thing. 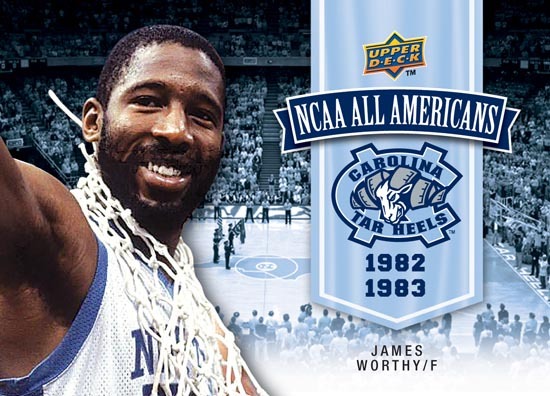 But did you know it all started in 1991, with the 40th anniversary? One of every past Topps card was randomly inserted into packs. Now, I don’t know about anyone else, but I was never lucky enough to pull one. In fact, I’ve only heard of two vintage cards ever getting pulled (a common from 1971 and a common from 1975). Granted, there’s a lot of unopened (and usually cheap) 1991 Topps wax out there. But still, when you’re talking about 39 years of cards, if one of every card has been put in, a lot more should have been pulled in these 20 years, overprinted supply or not. That’s another problem with the 1991 set, and really with every major set from about 1987 to 1995 or so: overproduction. It’s been 20 years since 1991 Topps came out, and I can still find unopened boxes. I can get a complete set for a couple bucks at most (true story: I bought a 100% complete set of 1991 Topps, including all the errors and corrections for $1 at the 2004 National). It’s a set worth picking up because it looks good. Just don’t pay more than a few bucks for it. The set, as stated above, was loaded with errors as well. And they seem to be real, legitimate errors due to proofreader carelessness, not junk errors created to attract attention. Checking out the checklist at KeyMan Collectibles (who has awesome info on every Topps set, and is where I got most of my rookie card info, so a major shoutout to them), there are at least 27 errors in the set. Did you know Moises Alou scored 37 runs in 2 games for the Pirates in 1990? He did if you believe Topps! One of the checklists even has two error versions as well as a corrected version. Everyone makes mistakes, but geez, 27 of them in a 792 card set? And best (or worst, whichever your perspective) of all, errors are still being newly discovered now, 20 years later. Jose Gonzalez and his evil twin. But which one is which?! 1991 was a minor gem in a land of crap. Fortunately it was the first year of back to back offerings that were better than anything Topps had put out for a few years. About the Author: Drew Pelto started collecting cards on a serious basis in 1991 and therefore has an incredibly nostalgic appreciation for the sets from that season, especially Topps and Donruss. He currently lives in Texas and is considering someday wallpapering a room with late 80’s and early 90’s commons. Print article This entry was posted by censored on July 30, 2011 at 7:52 am, and is filed under MLB, Product Reviews, Topps. Follow any responses to this post through RSS 2.0. You can skip to the end and leave a response. Pinging is currently not allowed. #1 written by Arnie P.
This was a decent looking set. Pictures were pretty good, design decent, quality of printing though could still have been better. I loved the old Stadium Club cards, the first few years of them i really loved the design, and they continued for a long time with great photography and great glossy deep-colored printing, so where are they today? We have gone backwards and downhill, from Stadium Club to a bunch of jerky sets that look similar to cards produced in the early 1900′s or older even, and the emphasis is on “hits” instead of great borderless high-gloss quality photos and printing. Oh well, back to the base Topps set, it just doesnt turn me on, but i do love the Clemens and Santiago cards that you show here, they are great. This set was such a missed opportunity. There are some classic photos like the ones you showed in the post, but the printing quality didn’t live up to the design quality and the hype surrounding those photos. Then one year later they finally go to white card stock. They could have done that for their 40th anniversary, but no. Another thought. 1991 was when they brought back the horizontal cards. I know they used them for subsets like Team Leaders and team checklist cards in the ’80s, but when was the last time they used them for plain old base cards before ’91?